For large companies that ship parcels among global offices, the default solution for courier and parcel shipping is to use a “free” carrier-provided solution. But – surprise! – these tools are not designed to save you money; they’re designed to make money for carriers. Overspending. Carrier solutions don’t recognize and restrict bad behavior. Just because a letter can get there the next day doesn’t mean it has to. Inflexible carrier choice. When you’re locked into one provider, you most definitely overpay for certain lanes where that carrier is less competitive. Ambiguous service options. Carriers can benefit when parcel shipping options are unclear and you choose a higher-cost option. Did you know that Next Day 9 AM can be 480% more expensive than regular Next Day? Poor control. Standalone point solutions don’t integrate to a single global repository that lets you monitor and manage your total inter-office shipping spend. The Acuitive Mailroom shipping solution is a simple, easy-to-implement way to take control of your non-PO related small package and courier shipping – using your existing carriers and contracts. We level the playing field with major carriers by letting you determine when you want it to arrive, and then work backwards to automatically identify the lowest cost option to meet the desired ETA. Result: a 20%–30% reduction in inter-office shipping. 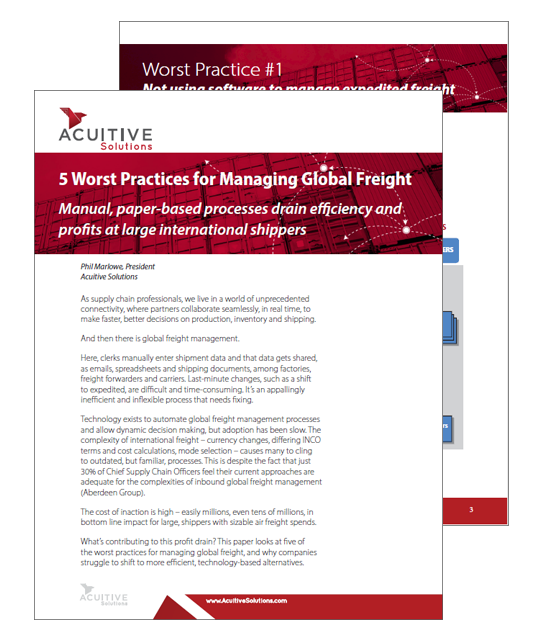 If your inter-office shipping processes lack sufficient controls, this could be one of the easiest and quickest paths to transportation savings. We’d be happy to discuss your current process and assess the improvement potential. Contact us to arrange a preliminary call.